Going to Good Hope A&E twice in the space of 12 hours. Oh joys. Saturday started off fairly normal – breakfast, shopping in Lichfield, food shopping in Tamworth, followed by lunch at home. I had made chocolate flapjacks the afternoon before and had one after my lunch. Delicious, I thought. I’ve never been a big fan of them but at least I can eat them without pain now, right? Oh how wrong I was. A couple hours later, I was having abdominal cramps. They got steadily worse, not helped by a hot bath, a cup of tea, a glass of coke or a abdomen massage around my ileostomy – all the home remedies for a stoma blockage – and when I checked Pricilla at around 6pm – by changing my bag, it could have been strangulating it causing it to block – she was not moving at all. 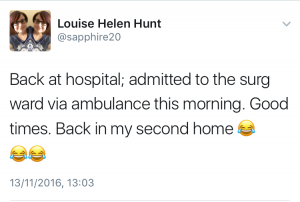 I called our NHS 111 services who advised going to the local A&E department to get checked out. Saturday night, early November… it was going to be a long night. Looking dehydrated and pissed off. And it was. 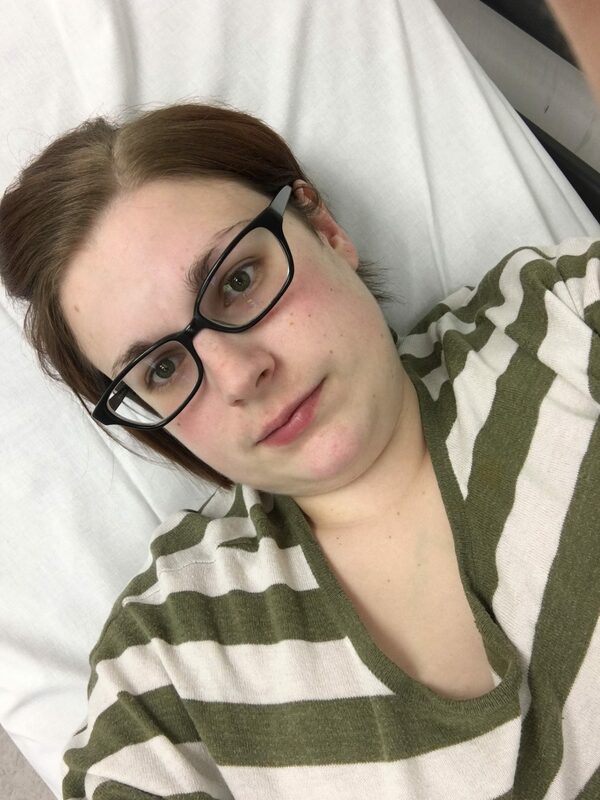 I was released 6 hrs later – roughly 2.10am – after having had x rays, bloods and a lovely A&E doctor palpitate my abdomen, which started my stoma working again. Wonderful, a quite quick resolution considering it could have been a lot worse. But after a couple hours sleep in my own bed, I was suddenly woken up with a violent need to be very sick and I was. And that continued every 15 minutes for a couple hours. I was, by then, in absolute agony – I was bloated and cramping beyond anything else I had every known. My mom called for an ambulance. 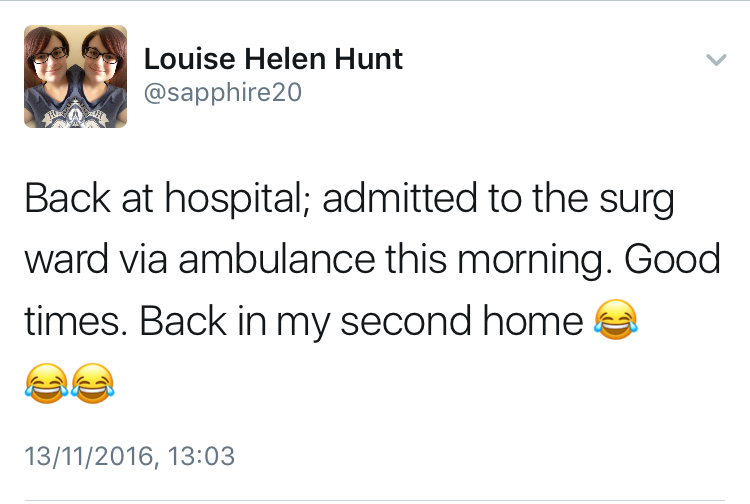 After finding our house, two wonderful paramedics tended to me in my room – whislt I rolled around, doubled up in agony, knowing I would need to go back and this time it wasn’t going to be so quick – gave me a cannula, started a paracetamol drip, hesitate to give me morphine but knowing I would need it, then got me into the ambulance for the drive to the hospital. In route, I had three doses of morphine into my cannula, was sick again but started to feel much better for just having some relief from the pain at this point. I needed to have everything I had done the night before repeated so a new A&E doctor could assess me correctly, he ordered a surgical consult too, as they would be the team to determine the status of my stoma. 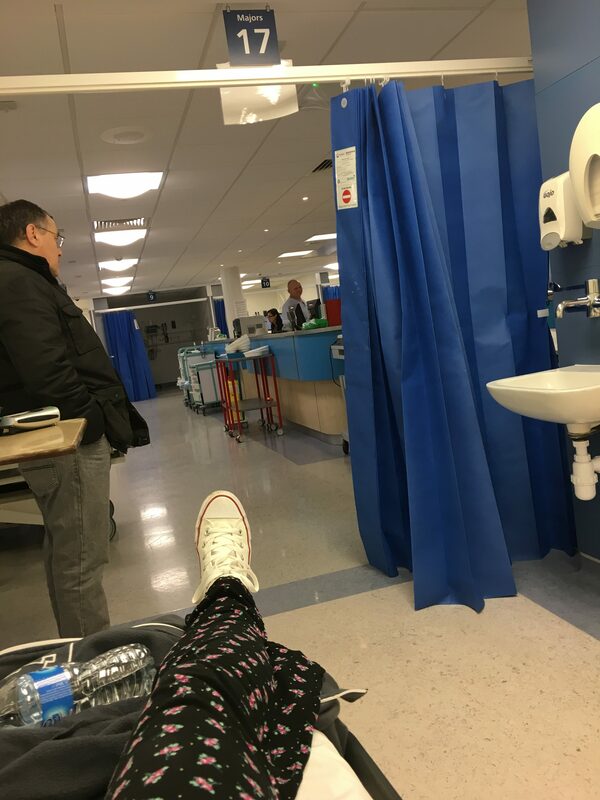 In the hours we waiting to have the tests done and to see doctors, I was sick again; this time releaving all of my pain and my stoma started to work again. I wasn’t however out of the woods: I needed to be monitored on a ward – my second home, Ward 16, the surgical ward. I was moved up there in the afternoon and got seen by the team quite quickly. 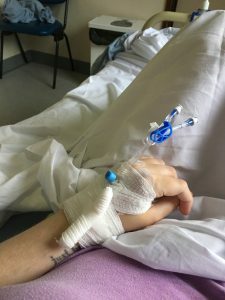 I needed to remove my bag for the surgical registrar to check my stoma – he needed to do a digi test, by which meaning he would stick a gloved pinky finger into my stoma to check there wasn’t anymore of a blockage left behind. I was on free fluids only, I was starving having not eaten since Saturday lunchtime. 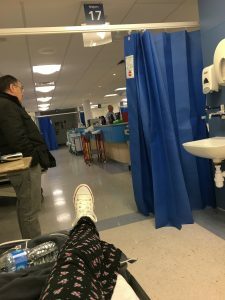 The registrar was midly impressed by how well I was coping with my ileostomy – after only three months – and how good the stoma nurses had trained me in changing my bag and looking after Pricilla. I was kept in overnight, with the promise of being discharged the next morning after I had breakfast and it proved to have stayed down. 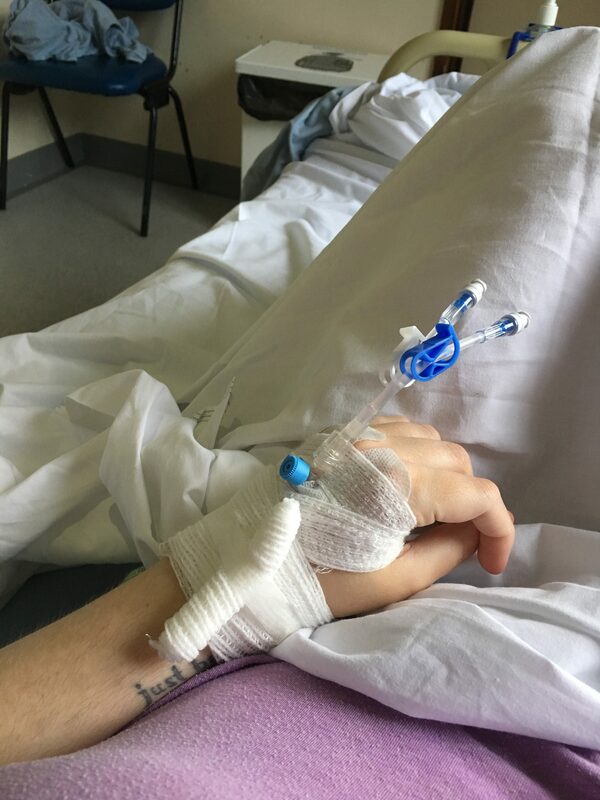 I ended up staying until late afternoon because they also wanted me to have lunch too to be doubly sure the ileostomy was continuing to work and my pain was resolved too. Good on both fronts by 4pm. So what caused this to happen? Definitely the flapjack. Rolled oats, not soaked in milk or water like in porridge and then baked making them more difficult to digest? Yeah, it was a bad decision. I’ve never had such pain like it; it was worse than the pain I had suffered with over the summer between surgeries. Horredous. But I’ve been advised to not let this put me off eating oats again. Okay, try them in a different way, make sure they are cooked and softer; but to not be disappointed by the fact that things will get stuck on occasion. My stoma nurse has always believed that having a stoma shouldn’t mean you have to give up food. If anything, this ileostomy has meant that I am able to eat more food and a better variety of them, giving my body what it finally needs! I crave fruit! I need more water! I vary my proteins and carbs now. Its been life changing and this is only the beginning. This – FLAPJACKGATE – is just a blip and a learning curve. A lesson learnt. And boy have I learnt it well.